Sotobori Park (外濠公園) is a park which located beside of the ruins of the outer moat of Edo Castle. It goes about 2km along the moat. There are many Sakura in this park. 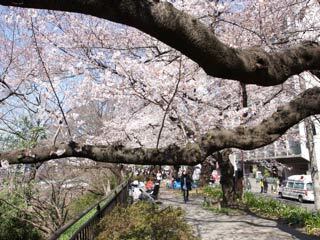 Therefore, Sotobori Park is a popular Hanami spot in Tokyo, especially for young students because Hosei University. When you have Hanami Party, don't located at in front of Tokyo Teishin Hospital. Take your garbage with you after the party. There are restrooms, but no parking. Most of Sakura spot are located between Ichigaya Station and Iidabashi Station. Around the Yotsuya side of the park, there are many sports facilities such as tennis courts and baseball field. Both of them have lights for night activity.